The peaceful mosque is influenced my many modern architects and modern ideas related to peace. 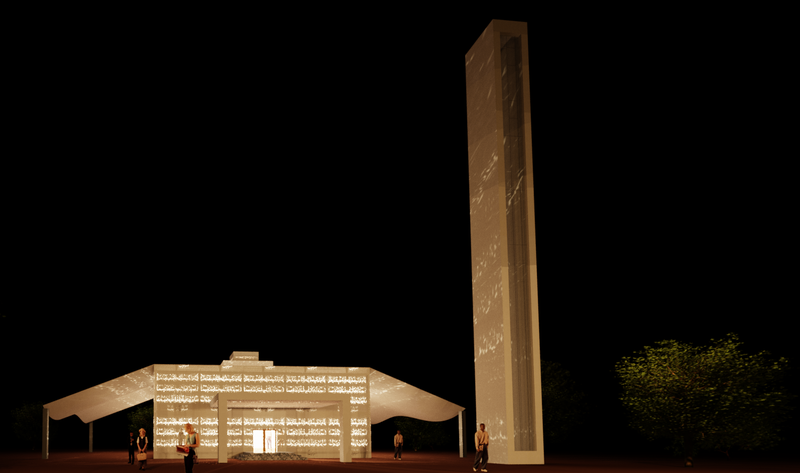 There are three main aspects that are taken into consideration to form this concept of a peaceful mosque. These aspects are the influential elements, the elements used to create the mosque and lastly the form of the mosque. To begin with one of the influential elements were a video in which Khalid a Muslim man asks non-Muslim strangers in Leicester City Centre, England to listen to a part of the Quran. Most of the reaction was that the voice was peaceful, relaxing and the words have a deep meaning even though they don’t speech the language of the Quran or understand the words. This aspect is what effected the façade of the building, it brought up an idea of making the façade of the mosque with words of the Quran that relates to peace in Islam and that would reflect shadows on the ground inside the mosque. That effect would make the people be able to read these words with great meanings and could affect their lives in order to make the world a more peaceful place. 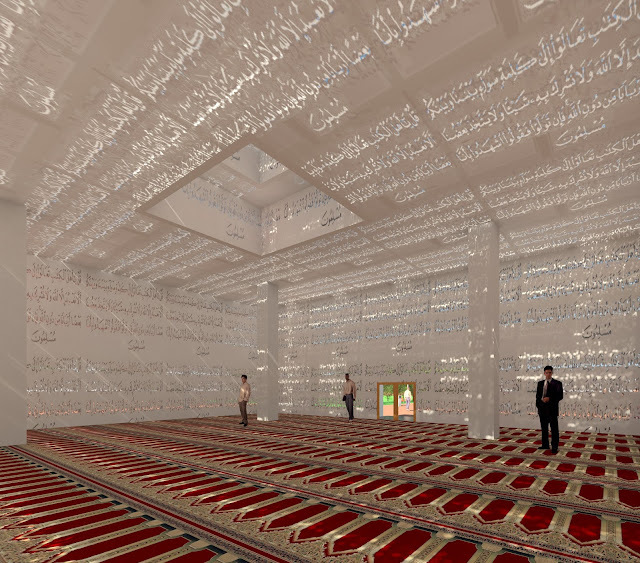 Another influential element would be the modern architects that build modern mosques or futuristic mosques. 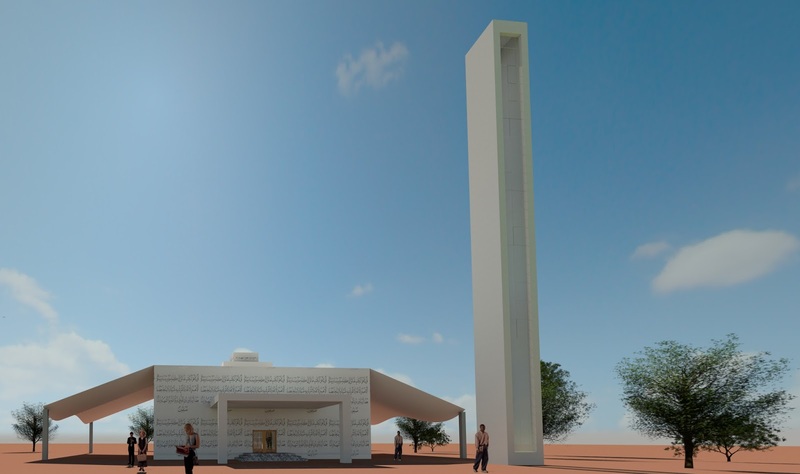 For example, the Gothenburg Mosque designed by Björn Sahlqvist that is built in Sweden and funded by Saudi Arabia. It had a modern minaret that suits today’s environment which is the people curiosity of finding out what is inside the building which makes architects use glass and openings and of course for many other reasons. Secondly, the elements that are used to create the peaceful mosque. These elements are the main element that any contemporary mosque should incorporate within a mosque. Which are the minaret which is used for acoustic purposes in which the voice of the imam calling for prayer should be heard by the neighbors, the dome in which used also for acoustic purposes in the old times before the invention of speakers and also is as a symbolic representation of the vault of heaven, the mihrab which is also called the Qibla wall usually highly decorated and it is the wall in which points toward the Qaba and it is the direction of prayer and lastly the Minbar in which the imam says his speech in a Friday prayer. Moreover, the peaceful mosques incorporates a garden that is inspired from the garden in Cordoba Mosque that has a symbolic meaning related to paradise. Last but not least, the form of the peaceful mosque that is mainly cubism since it has a symbolic meaning in Islam and also relates to modernism. The symbolic meaning is related to the Qaba which is the house of god that is symmetrical and equal in four sides quoted from boundless.com “Islamic decorations and architectural motifs rely heavily on repeated square, octagonal, and star motifs, symbolizing the infinite and conveying a spirituality without the iconography of other religions.” In addition, cubism relates also to the modern world and it is the first truly modern movement emerge in art by and later on developed in architecture in the 20th century. It evolved during a period of heroic and rapid innovation between Pablo Picasso and Georges Braque. "Introduction to Mosque Architecture | A Beginner's Guide to the Arts of the Islamic World |Khan Academy." Khan Academy. N.p., n.d. Web. 21 Nov. 2015. "Elements of Traditional Islamic Gardens." People - Opposing Views. N.p., n.d. Web. 21 Nov. 2015. "Geometric Symbolism." Boundless. N.p., n.d. Web. 21 Nov. 2015. "Cubism Movement, Artists and Major Works." The Art Story. N.p., n.d. Web. 21 Nov. 2015.